Another month, another fantastic box from Treasure Tress! 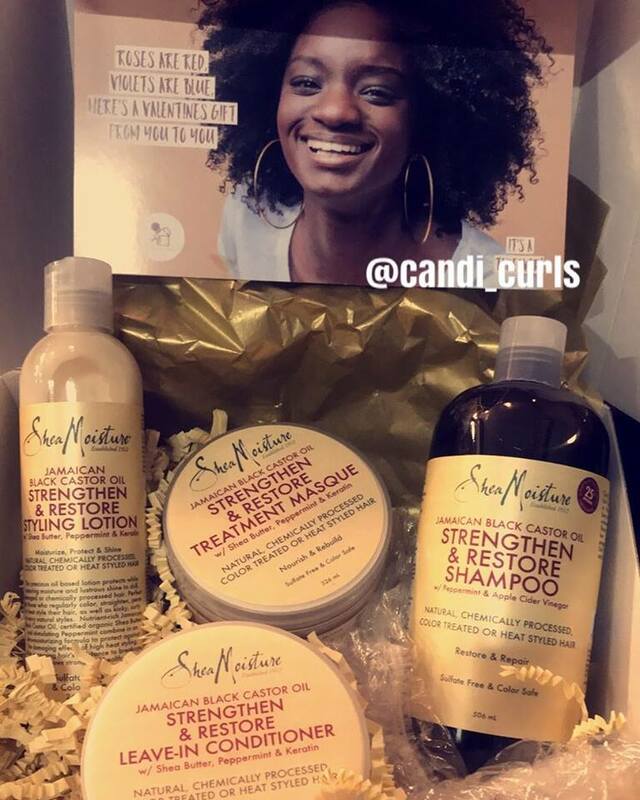 I was so happy to see that this months box was a Shea Moisture JBCO takeover box. Once again i have been reintroduced to one of the brands which i began my hair journey with. If you have been with me from the start on this blog, you will remember (or see) that this leave in in particular, was my holy grail when i began my journey. I stopped using it, not because there was anything wrong with it at all, just because i was being greedy and wanting to try EVERYTHING out there. This months box has got me back in love with this range and i wont ever leave it again. Jamaican black Castor oil is for me, a must have! This is the number one oil which is going aid with hair growth and out of all the other Shea moisture ranges i have tried, this one is by far my favourite. So what else was in the box? "This precious oil based lotion protects while restoring moisture and lustrous shine to dull, damaged or chemically processed hair." Directions: Squeeze a small amount into hands, and apply to damp or dry hair starting from roots to the ends. Do not rinse out. One of the things i liked alot about this product, is that it states on the bottle that it can be applied to damp OR dry hair. There are so many products out there that are to be used on damp and wet hair only, and sometimes i don't want to refresh my hair with water. This actually works excellent on dry hair and is very moisturising! It has the same smell which is present throughout the whole range (and smells amazing) and a little goes a long way so it lasts a long time. When i first tried this (at the start of my journey) i used too much and was left with sticky hair. Now that i know what mistakes i made, i have had some excellent results with using this product. It leaves my hair feeling very soft. Would i buy this product? YES! I have no faults with this at all. I should probably start this review by letting you know that Shea Moisture made some changes to the formula of some of their products across the brand. I am not sure of the exact changes and if they made any to this shampoo, but i feel it is important that you are aware of this when reading my thoughts. I used this shampoo at the start, and i liked it, at first. As i started to understand my hair a little more and branch out and try other brands, i quickly went off this shampoo. Where i thought that it was doing my hair good, i soon realised that it was actually drying my hair out alot. It is a very very thick shampoo, and i felt that my hair was very straw like which is not a good sign at all. Due to changes in formula in products by Shea moisture, i am willing to give this shampoo another go and so will update you. Would i buy this again? If it is the same as before ... no. This is one of my all time top hair masques. Even when i strayed away from the brand as a whole, this masque has ALWAYS been in my collection. As with the shampoo it is quite a thick masque, but this works perfect with my thick hair, as a little goes so far. It penetrates deep into the strands of hair, and leaves me with soft and healthy curls every time. See the video below for exactly how i use this hair masque. Would i buy this product? I can not live without it!! When i saw this in my box i got so excited! This baby right here was my holy grail and the best thing ever at the start of my hair journey! I couldn't wait to use it. I was not aware of changes to the formula until i opened this tub. When my hair was washed, i decided to use up what was left in my old tub first before opening a new one. When i got round to using this one .... i had to check that i was using what i thought i was. The consistency, the colour, the smell, everything is different! The old one, was so runny you literally poured it into your hands and it was more of a yellow colour. The jbco smell was strong and the results were amazing. This one is more of a brighter, whiter colour and is very very thick! It is more creamy than runny which fair enough most leave in conditioners are, but this one was PERFECT the way it was. I took to twitter and instagram to check that it wasn't just me and alot of people got back to me to say that they didnt like the new formula and it didn't work as well for them etc. I was very sceptical now. I got the same great results as before and have fallen back in love with my baby! So to answer would i buy this again? YES! New formula, old formula, whatever they're doing in that factory is working for my hair. TreasureTress is a monthly subscription box costing £20 a month (+p&p) and delivers you 4-5 FULL SIZED products. Subscriptions can be paused or cancelled at any time so you are not tied into a contract.